Justin Bieber has been involved in a car collision in Beverley Hills, police have confirmed to the BBC. Video footage showed the singer striking a photographer with his car after he left a service at The City Church in Los Angeles on Wednesday. The Beverly Hills Police Department said the vehicle had been travelling at an “extremely slow speed” when the collision took place. The BBC has contacted the 23-year-old’s team for comment. “At 21:24 local time [05:24 BST] we received a radio call about a vehicle-pedestrian collision on Hamilton Drive,” Sergeant Matthew Stout of the Beverly Hills Police Department told the BBC. “We arrived on scene and found a 57-year-old pedestrian on the ground. He was transferred to local hospital with non life-threatening injuries. Bieber was seen standing over and speaking to the injured man, who was reportedly a photographer, after the incident. Sergeant Stout confirmed Bieber “got out of the car and attempted to render aid” after the collision. The pop star was heard asking paparazzi to give the pedestrian some space and offering to help him immediately after the incident. The singer has been hitting the headlines in the last week after being banned from China due to “bad behaviour”. He has also cancelled his remaining world tour dates, citing “unforeseen circumstances”. The move affects 14 dates in Asia and North America which were coming up over the next three months. 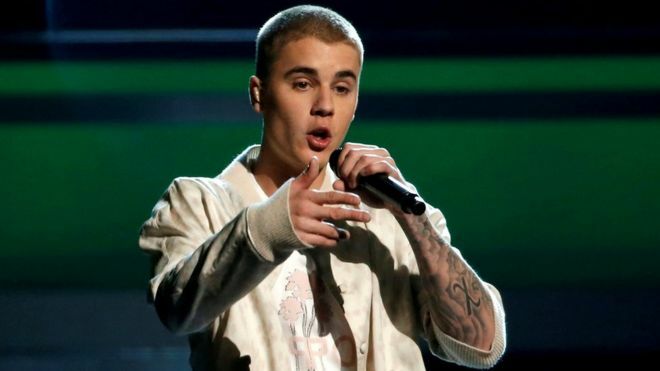 His Purpose world tour included a date at London’s Hyde Park and attracted attention when his rather demanding tour rider leaked online.